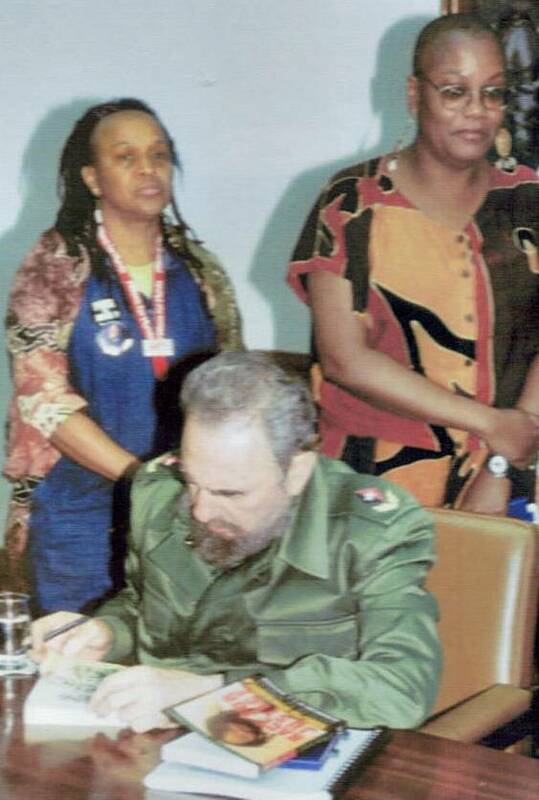 Pam Africa and Monica Moorehead with Fidel as he signs books for Mumia, June 19, 2000. In the third week of June 2000, I traveled to Havana, Cuba, as part of a U.S. delegation to participate in a roundtable discussion on the prison-industrial complex in the U.S. Some of the delegates included Pam Africa from the International Concerned Family and Friends of Mumia-Abu-Jamal; Gloria Rubac, a leader of the anti-death penalty movement in Texas; Rosemari Mealy, a former member of the Black Panther Party with Mumia in Philadelphia; attorney/activist Lennox Hinds; the late movement lawyer Leonard Weinglass; Gloria LaRiva ; and myself, representing Workers World Party. Many Cubans were interested in the struggle to free political prisoners, especially the cases of Mumia Abu-Jamal and Shaka Sankofa, who was eventually executed in Texas just weeks after our visit. One of those interested Cubans was Comandante President Fidel Castro. We had the honor of meeting Fidel on June 19 after we filmed the roundtable discussion seen by millions of Cubans on the island. As we sat around a table in the office at his residence, he asked us many questions about Mumia and Shaka’s cases, along with the state of the prisoner solidarity movement inside the U.S. We then took photos with him, along with an official group photo, as he signed books for Mumia and Shaka. The next day during our tour of Old Havana, we were suddenly told by our guide that we had a “visitor” waiting for us, so we would have to cut our tour short. That “visitor” happened to be Fidel, waiting for us at our guest housing, quite an unexpected and indescribable surprise for us. As we walked into the room, he pointed to his watch and stated in Spanish and with a laugh that we kept him waiting, which put us all at ease. We then sat together with Fidel to watch our roundtable discussion as he discussed each of our comments in a very serious manner. Thinking back to that moment, I reflect on how few leaders of a country would take time out of their overwhelmingly busy schedule to visit, not once but twice, individuals who are neither diplomats nor have any kind of official title. But how many leaders are like Fidel? A leader who was always about showing solidarity with the struggles of oppressed peoples, be it in Africa, Latin America or the U.S. I have been very lucky to have visited Cuba four times, including as part of the Venceremos Brigade in the late 1980s and the World Youth Festival in 1997, where I first met Black freedom fighter Assata Shakur. But the meeting with Fidel will always hold a special place in my heart and mind. Upon hearing of his death on Nov. 25, all of those memories of being in his almost overpowering presence brought both an appreciative smile and tears. There will never, ever be another Fidel, and the best way to honor his legacy is to aspire to live like him — a revolutionary socialist dedicated to liberate all humankind from all the evils of imperialism.